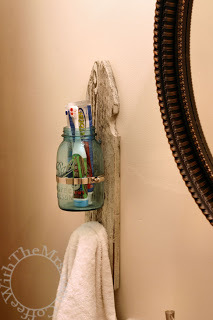 So, some time ago I had pinned the below mason jar Toothbrush and Towel holder that "Coffee With The Mrs"
While I didn't have a need for a toothbrush holder, I just loved the Shabby Chic approach "Coffee with The Mrs.com" took and knew I'd have a ton of uses for that. The first that came to mind was all of my paintbrushes. 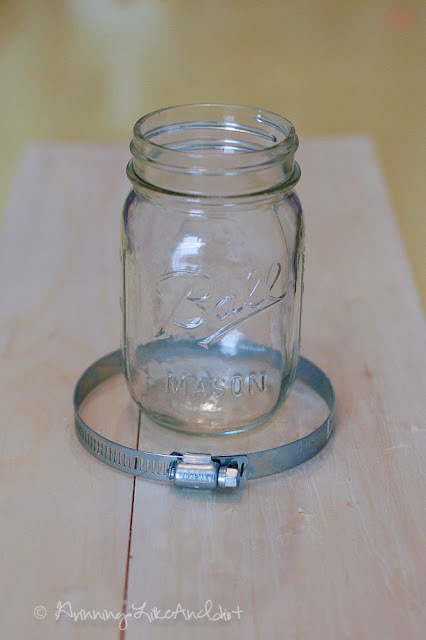 Using Pipe clamp, spray paint, wood and a Mason Jar. I got to work. The first thing I did was beat the heck out of the wood and racked screw drivers up and down it in random order to give the wood a distressed look. If you have old wood, you get to skip this step. Next I took wood glue and clamps, glued the pieces together using Elmer's Wood Glue. 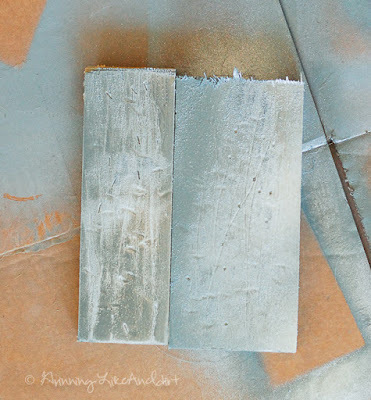 Then I took 3 colors of spray paint: Grey for the base, Metallic Silver and Turquoise for accent. The Silver and Turquoise sprayed I randomly on to the wood to get the above look. 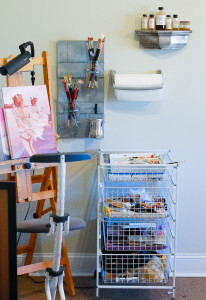 My craft/work room is very compartmentalized and in this corner I have my painting station. 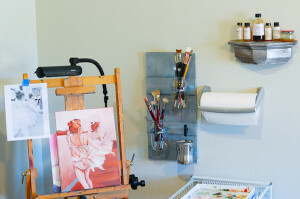 Before I made the wall sconces and installed the shelf I had to go around my room to get my supplies (paint brushers were in the 3rd drawer, the mediums were in a basket, and I usually would have to hunt for the paper towel). Now, everything is right there! I have all my paint brushes in the jars, and on a handle I have my Oderless Mineral Spirits and laying on the ledge is a wipe out tool (generally used by China painters but has proven to be useful in oil painting). 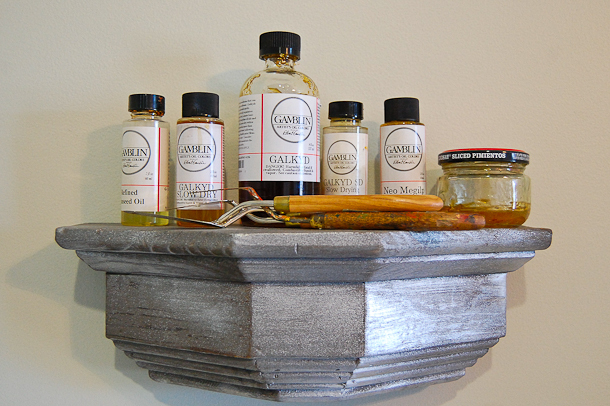 On the little shelf, I have my assortment of mediums and pallet knifes. Everything is right where I need it and it probably cost me around $20 (the shelf was the most expensive thing and even that I painted to get the look I wanted). 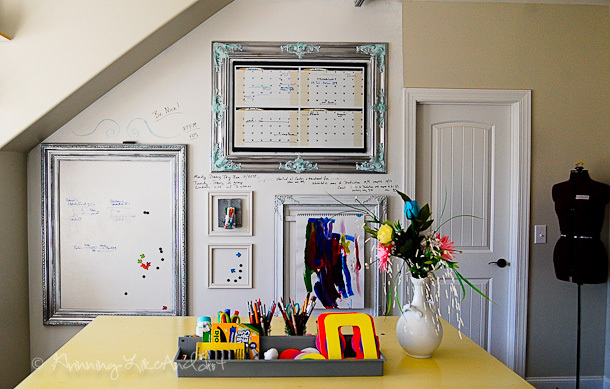 I also made a small one for the Whiteboard Markers that I shared in the post, "How to Make a Whiteboard Wall". To find more of the pins that inspire my organization, check out "My Style" Pinterest Board. I'd love to see what inspires you! Please leave a comment with a link to your favorite Pinterest Board!